Author: Abhishek Kini , Amit Munde . Dept. 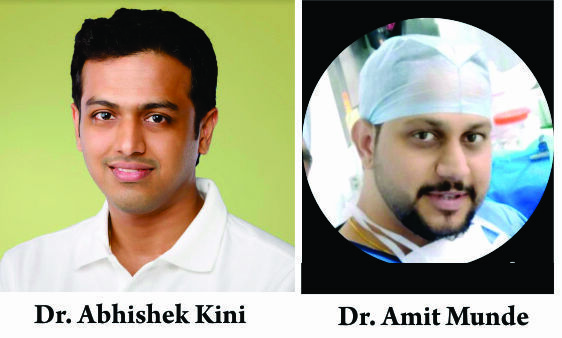 of Orthopaedics, PD Hinduja hospital & Medical research centre, Mahim, Mumbai, India. Background: Lack of consensus remains regarding management of the myriad of etiologies that affect the tendons traversing the hindfoot. Commonly affected tendons include the peroneals, flexor hallucis longus (FHL), tibialis posterior and the Achilles tendons. Tendoscopy is a largely unexplored approach in treatment of these varied causes. There is not enough international literature available on the utility of this novel technique. With this paper we aim to study the indications for tendoscopy, describe its technique and present its results. Methods: Sixteen patients with failed conservative care for the above mentioned tendon related complaints were treated tendoscopically from June 2013 to December 2015. We detail the surgical steps to perform tendoscopy. Age, gender, timing of surgery, work & activity demands, preop & 6 months postop AOFAS hindfoot score were noted. At final followup patients were asked to rate their overall result as excellent, good, fair or poor & whether they were satisfied. Results: Five patients had peroneal tendon, six patients had FHL, two tibialis posterior tendon and 3 Achilles tendon pathologies. 11 active high demand individuals were part of this group and all of these could resume their high demand activity by 6 to 12 weeks. AOFAS hindfoot score improved from 58.6 +/-8.9 to 81.3 +/-7.1 (p>0.05). All patients were satisfied with their surgical outcome. Conclusion: Tendoscopy is a safe technique to treat the tendons traversing the hindfoot. Advantage being ability to examine longer length of tendon in a minimally invasive manner leading to low morbidity, early recovery to activities. 1. Wertheimer SJ, Weber CA, Loder BG, Calderone DR, Frascone ST. The role of endoscopy in treatment of stenosing posterior tibial tenosynovitis. J Foot Ankle Surg 1995;34:15-22. 2. Van Dijk CN, Sholten PE, Kort N. Tendoscopy (tendon sheath endoscopy) for overuse tendon injuries. Oper Tech Sports Med 1997;5:170-178. 3. Van Dijk CN, Kort N. Tendoscopy of the peroneal tendons. Arthroscopy 1998;14:471-78. 4. Van Dijk C.N., Scholten P.E., Krips R. A 2-portal endoscopic approach for diagnosis and treatment of posterior ankle pathology. Arthroscopy. 2000;16:871–876. 5. Lui T.H. Flexor hallucis longus tendoscopy: A technical note. Knee Surg Sports Traumatol Arthrosc. 2009;17:107–110. 6. Lui T.H. Endoscopic assisted flexor hallucis tendon transfer in the management of chronic rupture of Achilles tendon. Knee Surg Sports Traumatol Arthrosc. 2007;15:1163–1166. 7. F. Steenstra and C. Niek van Dijk, “Achilles Tendo-scopy,” Foot and Ankle Clinics, Vol. 11, No. 2, 2006, pp. 429-438. 8. Scholten PE, van Dijk CN. Tendoscopy of the peroneal tendons. Foot Ankle Clin 2006;11:415-420. 9. Jerosch J, Aldawoudy A. Tendoscopic management of peroneal tendon disorders. Knee Surg Sports Traumatol Arthrosc 2007;15:806-810. 10. Vega J, Golano P, Batista JP, Malagelada F, Pellegrino A. Tendoscopic procedure associated with peroneal tendons. Tech Foot Ankle Surg 2013;12:39-48. 11. Scholten PE, Breugem SJ, van Dijk CN. Tendoscopic treatment of recurrent peroneal tendon dislocation. Knee Surg Sports Traumatol Arthrosc 2013;21:1304-1306. 12. Guillo S, Calder JD. Treatment of recurring peroneal tendon subluxation in athletes: endoscopic repair of the retinaculum. Foot Ankle Clin 2013;18:293-300. 13. Michels F, Jambou S, Guillo S. Endoscopic treatment of intrasheath peroneal tendon subluxation. Case Rep Med 2013:274685. 14. Cychosz CC, Phisitkul P, Barg A, et al. Foot and ankle tendoscopy: evidence-based recommendations. Arthroscopy 2014;30:755-765. 15. Van Dijk, CN: Anterior and posterior ankle impingement. Foot Ankle Clin North Am. 11:663 – 683, 2006. 16. Keeling, JJ; Guyton, GP: Endoscopic flexor hallucis longus decompression: a cadaver study. Foot Ankle Int. 28:810 – 814, 2007. 17. Lui, TH: Arthroscopy and endoscopy of the foot and ankle: indications for new techniques. Arthroscopy. 23:889 – 902, 2007. 18. Van Dijk CN, Kort N, Scholten PE. Tendoscopy of the posterior tibial tendon. Arthroscopy1997;13:692-698. 19. Bulstra GH, Olsthoorn PG, Niek van Dijk C. Tendoscopy of the posterior tibial tendon. Foot Ankle Clin 2006;11:421-427, viii. 20. Chow HT, Chan KB, Lui TH. Tendoscopic debridement for stage I posterior tibial tendon dysfunction. Knee Surg Sports Traumatol Arthrosc 2005;13:695-698. 21. Khazen G, Khazen C. Tendoscopy in stage I posterior tibial tendon dysfunction. Foot Ankle Clin2012;17:399-406. 22. Lui TH. Endoscopic assisted posterior tibial tendon reconstruction for stage 2 posterior tibial tendon insufficiency. Knee Surg Sports Traumatol Arthrosc 2007;15:1228-1234. 23. Hua Y, Chen S, Li Y, Wu Z. Arthroscopic treatment for posterior tibial tendon lesions with a posterior approach. Knee Surg Sports Traumatol Arthrosc 2015;23:879-883. 24. Monteagudo M, Maceira E. Posterior tibial tendoscopy. Foot Ankle Clin 2015;20:1-13. 25. Maffulli N, Kader D. Tendinopathy of tendo achillis. J Bone Joint Surg [Br] 2002;84-B:1-8. 26. Halasi T, Tállay A, Berkes I. Percutaneous Achilles tendon repair with and without endoscopic control. Knee Surg Sports Traumatol Arthrosc 2003;11:409-414. 27. Maquirriain J. Surgical treatment of chronic achilles tendinopathy: long-term results of the endoscopic technique. J Foot Ankle Surg 2013;52:451-455. 28. Pearce CJ, Carmichael J, Calder JD. Achilles tendinoscopy and plantaris tendon release and division in the treatment of non-insertional Achilles tendinopathy. Foot Ankle Surg 2012;18:124-127. 29. Turgut A, Günal I, Maralcan G, Köse N, Göktürk E. Endoscopy, assisted percutaneous repair of the Achilles tendon ruptures: a cadaveric and clinical study. Knee Surg Sports Traumatol Arthrosc2002;10:130-133. 30. Tang KL, Thermann H, Dai G, et al. Arthroscopically assisted percutaneous repair of fresh closed achilles tendon rupture by Kessler’s suture. Am J Sports Med 2007;35:589-596. 31. Vega J, Cabestany JM, Golanó P, Pérez-Carro L. Endoscopic treatment for chronic Achilles tendinopathy. Foot Ankle Surg 2008;14:204-210. 32. Thermann H, Benetos IS, Panelli C, Gavriilidis I, Feil S. Endoscopic treatment of chronic mid-portion Achilles tendinopathy: novel technique with short-term results. Knee Surg Sports Traumatol Arthrosc2009;17:1264-1269. 33. Lui TH. Treatment of chronic noninsertional Achilles tendinopathy with endoscopic Achilles tendon debridement and flexor hallucis longus transfer. Foot Ankle Spec 2012;5:195-200. 34. Gossage W, Kohls-Gatzoulis J, Solan M. Endoscopic assisted repair of chronic achilles tendon rupture with flexor hallucis longus augmentation. Foot Ankle Int 2010;31:343-347. How to Cite this article: Kini A, Munde A. Tendoscopy: A novel way to look at an Enigma; Indications,Technique & Results of managing tendon pathologies in foot and ankle. Asian Journal of Arthroscopy May-Aug 2018;3(2):24-29.